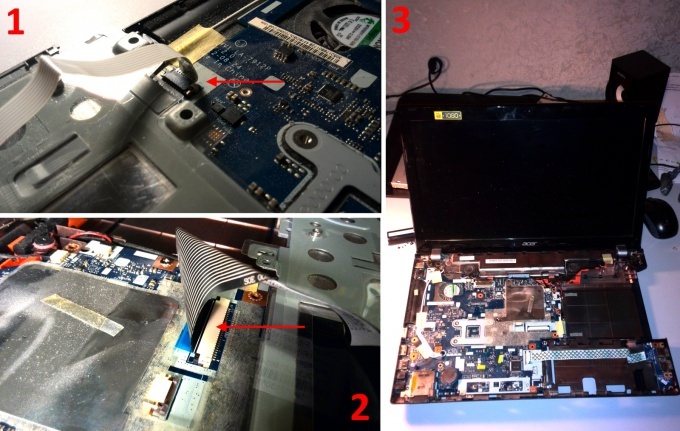 Laptop model Acer Aspire V3-571G is designed so that, for example, to clean the cooler, you need to completely disassemble the laptop. Of course, it's not the most convenient design. But if there is no escape, let's see how to do it. 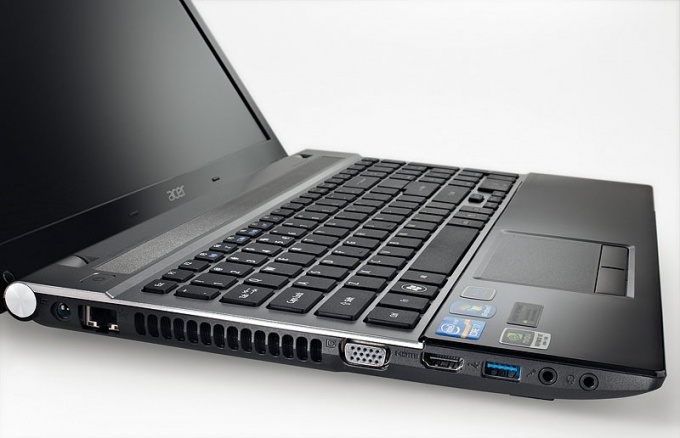 Turn over the laptop Acer Aspire V3-571G "in the back". Remove the battery by pressing in on the recessed housing orange button. 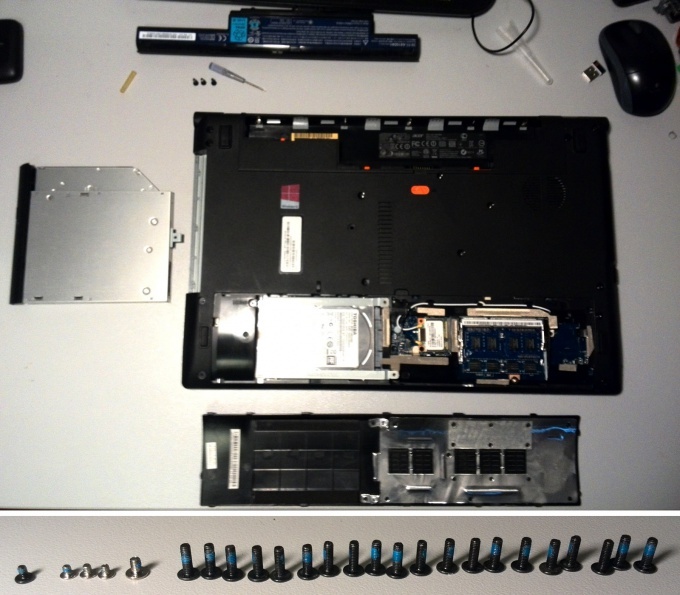 Unscrew all the screws located on the bottom surface of the laptop. 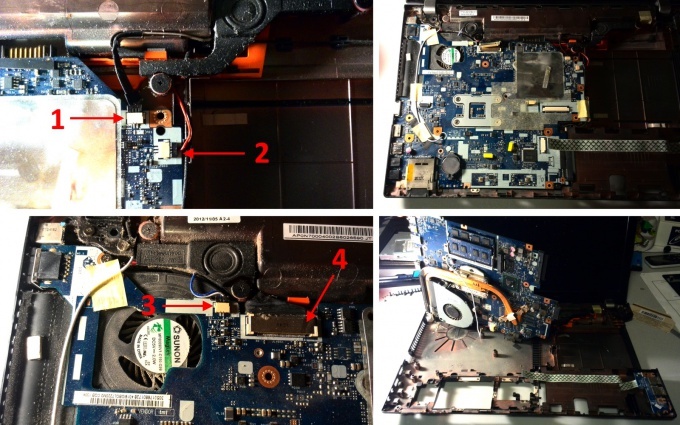 When all the screws are unscrewed, take out the DVD drive and open the compartment cover hard drive and memory. Under the lid are visible screws, Unscrew them all. Also Unscrew 3 small screws in the battery compartment. There must be unscrewed 20 black 8 mm long screws and 5 short. Disconnect white and black wires from the WiFi module. Now take out hard disk and WiFi module. Now poderem plastic overlay on the top panel, which is a touchpad laptop, and take a walk around the perimeter to Unclip all the plastic clips. When the latch is unfastened, the pad can be pushed. 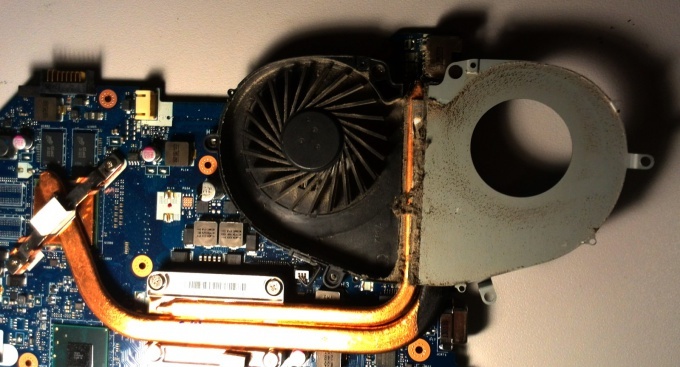 It connects with the motherboard of the laptop is thin trail. The standard way of the detachable connector loop: pull the latch that secures the ribbon cable in the connector and away from connector. 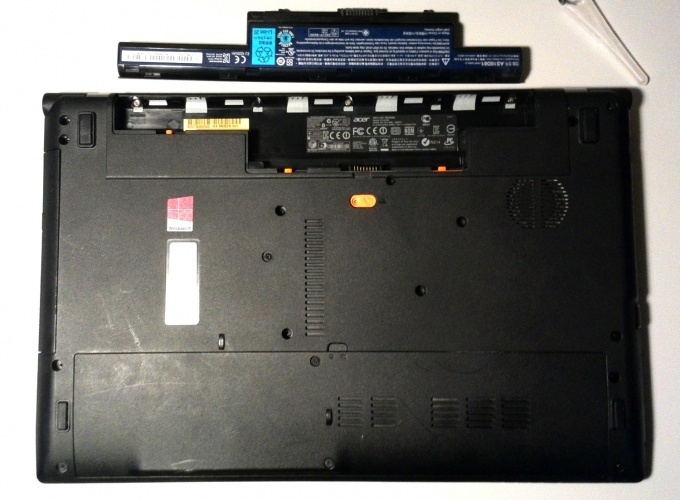 A panel with touchpad can be removed. 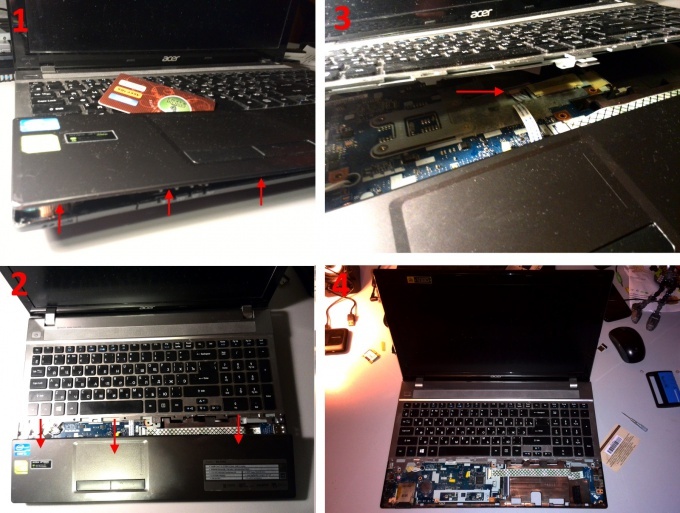 Now we need to remove laptop keyboard Acer Aspire V3-571G. To do this, Unscrew 1 screw located under the panel of the touchpad. Unclip the perimeter of the keyboard panel latches. Then flip the laptop and unfasten all clips, which silver keyboard panel is attached to the body of the laptop. Raise the bar with the keyboard. It connects to the motherboard by two ribbon cables. Disconnect them and then the keyboard can be removed. Views of the motherboard. 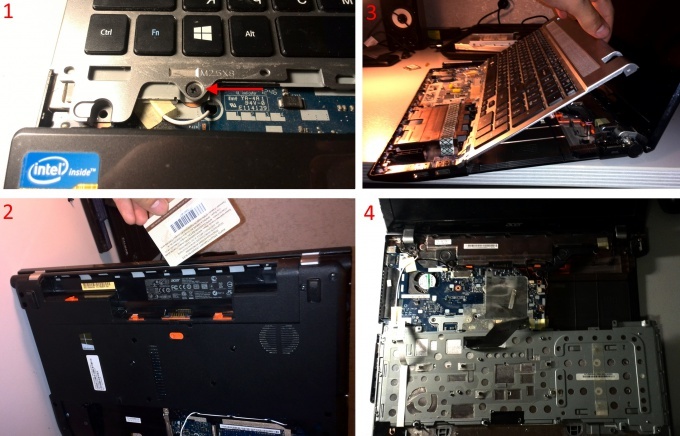 To remove the USB ports on the right side of the laptop Acer Aspire V3-571G, you need to Unscrew the studs they screw and disconnect the ribbon cable from the motherboard. Unscrew all the screws that secure the motherboard. Then disconnect all the cables, I need 4 on top and 1 on the bottom. Also pull out the black and white wires that go to the network module Wi-Fi. The motherboard is now easily removed. 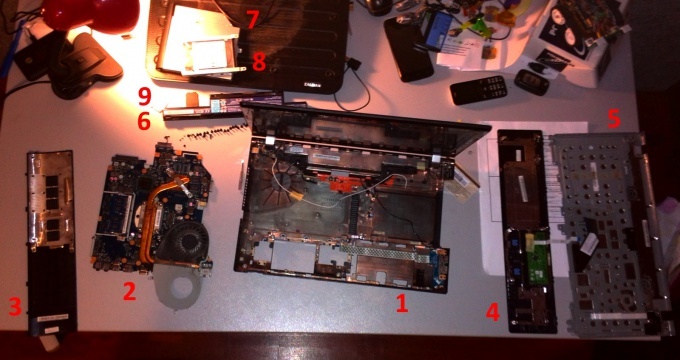 When I removed the motherboard, we get access to the cooler laptop Acer Aspire V3-571G. Its casing can be removed. It is attached with 4 small and 2 large screws. 9 - network card Wi-Fi.